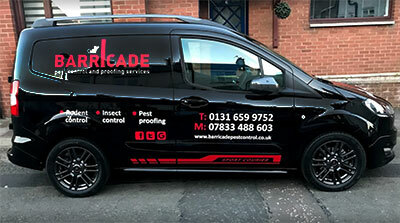 Barricade provide specialist pest control in Edinburgh and surrounding areas. We help homes and businesses get rid of mice, wasps, bed bugs etc. You have noticed droppings or smear marks around your home or business. Give us a call today! Barricade are fully qualified to quickly deal with wasp nest removal, rat control, mice control, cockroach, fleas, bud bugs, ant infestation, carpet moth and clothes moth to name but a few. If you think you have a problem with pests then call us today for free advice and a same-day call out. We are proud to be a family run local Edinburgh company with a reputation built on great customer service and very reasonable prices. We offer pest control services to homes and businesses throughout the EH postcode area. We serve restaurants, takeaways, hotels, guest houses and B&Bs – who need to maintain maximum levels of cleanliness and hygiene. We provide pest control services to homes and businesses such as restaurants, hotels, guest houses and shops in Edinburgh and the Lothians. From one-off eradication treatments to monthly contracts. Our commercial service contracts start as little as £20.00 per month. Proprietors Sean and Rebekah welcome you to Barricade pest control. We are a young, ambitious family who are dedicated to making your homes and businesses pest free. Barricade take immense pride in offering all our customers an honest, friendly and professional service and always take great care and time in providing you with all the expert advice and reassurance you need. We both come from premium customer service backgrounds and will always go the extra mile to ensure all our customers’ needs are met. We also come from a family of pest controllers (my parents run Wee Critters!) and have gained the expertise from some of the best in the business. A bespoke pest control service, tailored to your needs. We follow the Think Wildlife code of best practice for the safe use of rodenticides. We are a family-run, local pest control company in Edinburgh. We serve homes and businesses throughout Edinburgh and the Lothians. Some of the areas we cover include: New Town, Old Town, Leith, Easter Road, Abbeyhill, Holyrood, Portobello, Musselburgh, Craigentinny, Lochend, Restalrig, Seafield, London Road, Broughton, Stockbridge, Newington, Marchmont, Bruntsfield, Morningside, Blackford, Prestonfield, Liberton, Inch, Duddingston, Craigmiller, Niddrie, Newcraighall, Inveresk, Wallyford, Prestonpans, Tranent, Macmerry, Port Seton, Danderhall, Dalkeith, Lasswade, Polton, Loanhead, Bonnyrigg, Newhaven, Granton, Trinity, Comely Bank. We are always on call locally so please give us a call and we’ll be with you as quick as possible.